Include David Stevens, head of the Federal Housing Administration (FHA), as a person who doesn't believe in an immediate rebound in US home values. Stevens, according to a recent news report (link below), told a panel at the Mortgage Bankers Association convention that he believes that there will be a further 10% drop in home values by Q1 2010. Stevens points out that rising unemployment and tighter credit will be two contributing factors towards a continued decline of the US housing market. Many people have become increasingly confident about US real estate in recent weeks as several important economic indicators have started to tick higher. Home values, they argue, are close to reaching bottom after taking a savage beating over the past couple of years. 1. Increased unemployment. It's tough to imagine a strong recovery in real estate if hundreds of thousands of people continue to lose their jobs every month. When the unemployment rate in the United States does top out, what happens if we have a "jobless recovery" as many people are predicting? It's tough to imagine people buying homes in droves if they are extremely worried about the safety of their jobs. 2. Shrinking access to credit. It's much harder to get a mortgage these days. 3. Foreclosures. 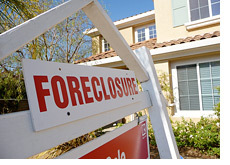 Foreclosures aren't expected to peak until the end of 2010 - how can the real estate market begin to recover with that much unsold inventory on the books of many banks? 4. General pessimism. It's tough to be optimistic these days. People (especially younger individuals and families) tend to buy homes because they feel optimistic about their futures. I think that many people will choose to rent until they start to feel more optimistic about the future of the US economy. 5. Option ARMs. $134 billion dollars worth of Option ARMs are expected to be recast in 2011 - many people can hardly afford their mortgages (with minimum payments) as it is. This is going to be very ugly, and I would expect many defaults as a result. 6. Dropping income levels. People are making less money, and I would assume that this will translate into less people wanting to buy new homes or upgrade into more expensive ones. The one positive right now might be that Americans are paying down debts and saving cash at a level not seen in years. When the economy starts to put in a sustained and strong recovery, this could bode very well for the US real estate market. In the near-term though, there certainly seems to be a number of different obstacles in the way of any sustained recovery in real estate in the United States.